From The Perry Mason TV Show Book \\ (Revised) Carol Delaney is a lovely young woman from the Midwest living happily in Los Angeles until Arthur Mallory, a stuttering bishop from Australia, walks into her life with a wild tale of adoption and inheritance. Mallory claims Carol is actually the granddaughter of multimillionaire Charles Burroughs, that he placed the infant Carol with a loving family at the request of her mother following the death of her husband, Charles Burroughs, Jr. To complicate matters, another young woman has come forward claiming to be the heir to Burroughs's millions. When the stuttering Bishop Mallory brings Carol Delaney and Charles Burroughs together, he expects a joyous reunion. But when Burroughs is stabbed to death Carol becomes the main suspect. Perry must prove not only Carol's innocence, but her right to inherit Burroughs's name and fortune. CARS: 1959 Ford Skyliner retractable, black, medium interior, top down (Mason), 1959 Plymouth 4dr hardtop (roof & interior only), 1959 Plymouth Savoy 4dr sedan, black & white (Police). From The Cars by Greg Cockerill. Based on the Erle Stanley Gardner novel of the same name, The Case of the Stuttering Bishop was previously made into a movie in 1937. Donald Woods starred as Mason, with Ann Dvorak as Della Street. Location: The home occupied by Charles Burroughs would be used again only three episodes later, #62 TCOT Howling Dog. Oh, there is different furniture, and some things have been rearranged, but the distinctive double doorway entrance, and the sun burst over the doors gives it away. Submitted by PaulDrake33. When Philip Burroughs is being sworn in off camera, the �I do� is clearly in the distinctive voice of actor Ken Lynch (Wallace Lang). Killer Karl Davis (pictured above) makes his only appearance on Perry here playing Leo Kaster. Most people would think that Killer is a strange name for an actor, but Karl Davis was orginally a professional wrestler, and Killer was his ring name. Submitted by PaulDrake33, 11 August 2009. Herb Ellis makes his only Perry appearance here playing the Deputy District Attorney. 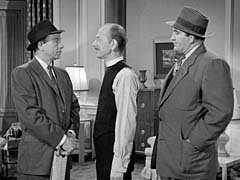 Herb Ellis was the original Officer Frank Smith on the original Dragnet in 1952 for 8 episodes before he was replaced by the more familiar Ben Alexander playing the same role. Submitted by PaulDrake33, 11 August 2009. +Although this is true, it should be noted than Sgt. Joe Friday had two partners before Officer Frank Smith: Sgt. Ben Romero, played by Barton Yarborough, who died shortly after the series started, and Sgt. Ed Jacobs, portrayed by Barney Phillips for the remainder of the first season. Submitted by Wiseguy70005, 1/24/13. Sightings: The Little Old Lady in a Hat sits behind Distinguished Gentleman #1 and �Miss Carmody� (who sit behind Janice Burroughs) in the courtroom. All three have moved to new seats on the defense side when court reconvenes. More about these frequent courtroom spectators here. Submitted by gracep, 8/23/2010. Additions by alan_sings, 16 Oct 2010. +Little Old Lady #2 sits in the last row behind Perry with a hat. The Distinguished Lady #4 sits behind Miss C. submitted by BigBill767, 2/4/17. The radio in Bishop Mallory's room is a Zenith model R625-Y AM radio. Notice the "H" in ZENITH on the front of the radio is missing. Submitted by Kilo 6/27/2017. In the original novel, the Charles Burroughs character's name is Renwold C. Brownley. 'Nuff said. Submitted by BobH, 8 March 2018. When we meet Charles Burroughs (at 12:10), he is practicing golf with a putter in his study. I had predicted the putter would be the murder weapon. Actually, he gets stabbed with a carving knife. This knife had been shown earlier (at 7:00) being used by Carol Delaney to carve meat at her own dinner table. The dinner scene even starts with Carol pulling the knife from its sheath. I commend Gene Wang for placing his clues well and for ably making it hard to predict his story line! Submitted by 10yearoldfan, 27 May 2012. Vaughn Taylor plays Bishop Mallory very well: he is genuinely delighted to hear Carol's answers to his questions (at 4:30), proving that she is the girl he is looking for. On the other hand, Della is given lines to mislead the viewer, casting doubt on the Bishop's authenticity (at 11:40): "There's no one alive who can vouch for his story." I tend to trust Della's instincts. Once again, I commend Gene Wang for making it hard to predict his story line. Submitted by 10yearoldfan, 27 May 2012. Is it just me, or does the stuttering bishop not stutter all that much? Ed Zoerner, 11/15/12. We are given a strong clue that Philip Burroughs is lying when he pays his first visit to Mason's office (at 17:20). He tells Mason, "I told him [Charles] he was wrong!" But earlier (at 12:50) Charles Burroughs had disparaged Philip for never having had the nerve to contradict him. Submitted by 10yearoldfan, 27 May 2012. Sometimes in Perry Mason, the killer could be any of a number of suspects. In this episode, all the evidence incriminates Philip. He is completely unsurprised (at 18:26) when he sees blood flowing under the door to his uncle's study. His line (at 19:15), "Something is wrong with the light switch" is unnatural for someone who knows the house and its lighting fixtures so well. He is again completely unsurprised (at 19:27) when he turns on the light to reveal the dead body. He is utterly creepy (at 20:24) when he insinuates that Janice might have been the killer (look at those evil white eyes and wart-covered cheek). His proposal to conspire with Janice to pin the blame on Carol is clearly pre-meditated. Aside from Perry's client, he alone had motive to kill Charles before the will could be changed. Even Della disparages him (at 31:20), "He has all the finer instincts of a scorpion." Once again, Gene Wang has made the Perry Mason series as a whole unpredictable, by occasionally making the real culprit so obvious that the viewer is tempted to look elsewhere. Submitted by 10yearoldfan, 27 May 2012. 10yearoldfan, pretty astute. Jonathan Kidd's 'Philip Burroughs' is one of the more loathsome characters to ever appear in a Mason story .. but I equally thought that 'Wallace Lang', or 'Janice Burroughs' might have done the deed. I often wonder if actor Ken Lynch scared small children and sensitive adults with that rock-grinding voice of his! This was a pretty good episode. 'Wallace' looked like he'd had a knife stuck in his gut as Perry peeled the layers off of his scheme with 'Janice', and poor 'Janice' looked as though she was going to faint, throw up, or both! Submitted by MikeReese, August 23,2013. + Ken Lynch played Chief Engineer Vanderberg in Star Trek's "Devil In The Dark," Detective Sergeant Grover in "McCloud" & Admiral Gray in "The Winds of War" [189 IMDb credits]. Mike Bedard 6.20.16. + Lynch's voice reminds me of Froggy of the Our Gang movies from the early 40's. Submitted by Kilo 4/18/2018.